The Calauit Game Preserve and Wildlife Sanctuary has evolved to become a home of important Philippine endemic and exotic wildlife from Africa. Calauit Special Project started in 1997 with the introduction of eight species on an experimental basis to see whether the movement of African wildlife from a subtropical to tropical habitat would succeed. 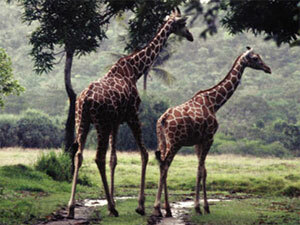 Eventually, 104 different exotic animal species composed of giraffe, eland, zebra, impala, bushbuck, gazelle and waterbuck arrived in the island. 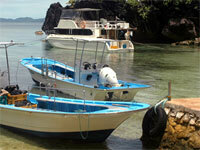 Sangat Island is located right amonst the World War II wrecks, and is also popular with lover of nature and birdlife. 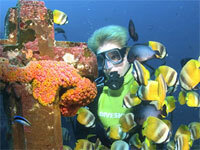 Busuanga boasts a staggering array of magnificent seascapes, jaw-dropping scenery and world-class wreck diving. 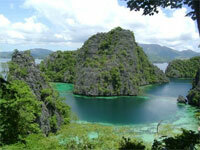 Coron is reached by direct flights from Manila or El Nido, or by ferry from El Nido. Coron Island is best known for the eight out of twelve Japanese supplies shipwrecks that were sunk by the United States Navy during a massive air bombing campaign during World War 2. These ships were sunk at depths of 10 to 43 meters and some of the wrecks are 160 meters in length, with most of the ships still intact. The water is incredibly clear and perfect that you'd be able to spot different species of fish like the yellow fin tuna, groupers, scorpion fish and lionfish. Busuanga boasts a staggering array of magnificent seascapes, jaw-dropping scenery and world-class wreck diving‚ - virtually a platter of adventure for the intrepid. The island province has been declared a nature sanctuary of the world and for good reason. It is wrapped in a mantel of rainforests, outstanding dive sites, majestic mountains, primeval caves and shimmering beaches. Ideal for birdwatching enthusiasts. 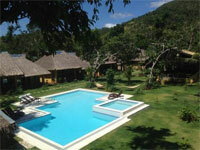 Enjoy a stay in a lovely Coron resort, with the attention of local birding guide. Enjoy a relaxing stay in beautiful, peaceful surroundings, with tropical birds and butterflies around you.